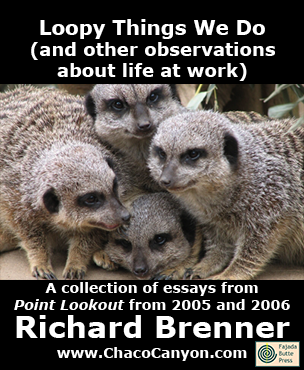 Loopy Things We Do (and other observations about life at work) is a collection of past issues of Point Lookout, my weekly email newsletter of tips, insights and perspectives that help people in dynamic problem-solving organizations find better ways to work with each other. The articles are from 2005 and 2006. The book gives concrete, nuts-and-bolts methods for dealing with real-life situations. Have you ever found yourself sitting in a meeting, listening for the third time to drivel you just couldn't believe people would actually say out loud, and wondering how much longer this would go on until they finally agreed to what anyone with half a brain knew they'd have to do anyway? And then groaned to yourself when you realized that your next meeting would be more of the same? Or have you ever had the kind of "forehead-slapping moment" when you suddenly realized why the group didn't go for your last suggestion, and then wondered how you could possibly have been so naïve as to have proposed it in the first place? Loopy Things We Do is a collection of short articles that give tips, insights and new perspectives on life in the modern workplace. 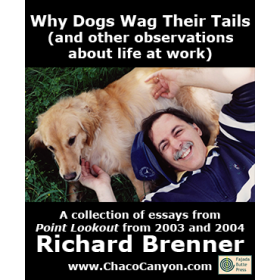 It's drawn from the 2005 and 2006 issues of my newsletter, Point Lookout , and it's filled with the insights you need to make sense of it all. It helps you avoid the traps and pitfalls that await you at work, and it guides you into new choices that can make life at work more enjoyable and rewarding. Loopy Things We Do makes a wonderful and unique gift for a friend, a colleague, or a spouse who faces any of the ordinary — and many of the not-so-ordinary — challenges of working today. In emergencies, group problem solving is unusually challenging, especially if lives, careers, or companies depend on finding a solution immediately. Here are some tips for members of teams that are solving problems in emergencies. Participating in or managing a virtual team presents special communications challenges. Here are some guidelines for communicating with members of virtual teams. Where do the days go? How can it be that we spend eight, ten, or twelve hours at work each day and get so little done? To recover time, limit the fragmentation of your day. Here are some tips for structuring your working day in larger chunks. 10	Can You Hear Me Now? 13	Shining Some Light on "Going Dark"
Groups that can't even agree on what to do can often find themselves debating about how to do it. Here are some simple things to remember to help you focus on defining the goal. Project status reports rarely acknowledge negative progress until after it becomes undeniable. But projects do sometimes move backwards, outside of our awareness. What are the warning signs that negative progress might be underway? Most of us believe that the foundation of a well-run meeting is a well-formed agenda. What makes a "well-formed" agenda? How can we write and manage agendas to make meetings successful? Most of us follow paths through our careers, or through life. We get nervous when we're off the path. We feel better when we're doing what everyone else is doing. But is that sensible? The behavior of the office kiss-up drives many people bats. It's more than annoying, though — it does real harm to the organization. What is the behavior? When peers curry favor with the boss, many of us feel contempt, an urge for revenge, anger, or worse. Trying to stop those who curry favor probably isn't an effective strategy. What is? Condescension is one reason why healthy conflict becomes destructive. It's a conversational technique that many use without thinking, and others use with aggressive intention. Either way, it can hurt everyone involved. Condescending remarks hurt. When we feel that pain, we often feel the urge to retaliate, even when retaliation might not be appropriate. Our responses are more effective when we understand where condescending remarks come from. The question-and-answer exchanges that occur during or after presentations rarely add much to the overall effort. But how you deal with questions can be a decisive factor in how your audience evaluates you and your message. Your point of view — or reference frame — affects what you see, and how you experience the world around you. By choosing a reference frame consciously, you can see things differently, and open a universe of new choices. When I have an important insight, I write it down in a little notebook. Here are some items from my personal collection. At times it seems that nothing works. Whenever we try to get moving, we encounter obstacles. If we try to go around them, we find more obstacles. How do we get stuck? And how can we get unstuck? 45	Is It Blame or Is It Accountability? When you find yourself in a tough spot politically, what can you do? Most of us obsess about the situation for a while, and then if we still have time to act, we do what seems best. Here's a set of approaches that can organize your thinking and shorten the obsessing. Normally, you terminate or reassign team members who actually inhibit progress. Here are some helpful insights and tactics to use when termination or reassignment is impossible. At times, we need information from each other. For example, we want to learn about how someone approached a similar problem, or we must interview someone about system requirements. Yet, even when the source is willing, we sometimes fail to expose critical facts. How can we elicit information from the willing more effectively? Negotiating contracts with outsourcing suppliers can present ethical dilemmas, even when we try to be as fair as possible. The negotiation itself can present conflicts of interest. What are those conflicts? Most of us have information that's "company confidential," or possibly even more sensitive than that. When we encounter individuals who try to extract that information, we're better able to protect it if we know their techniques. When we deliver news at work — status, events, personnel changes, whatever — we sometimes frame it in a story line format. We start at the beginning and we gradually work up to the point. That might be the right way to deliver good news, but for everything else, especially bad news, deliver the headline first, and then offer the details. It's time we all began to take seriously the warning about a possible influenza pandemic. Whether or not your organization has a plan, you can do much to reduce your own chances of infection, and the chances of mass infection, by adopting a set of practices known as social distancing. Successful, persuasive presentations involve a whole lot more than PowerPoint skills. What does it take to present persuasively, with power? 65	Are You a Fender? Taking political risks is part of the job, especially if you want the challenges and rewards that come with increased responsibility. That's fair. But some people manage political risks by offloading them onto subordinates. Be certain that the risk burden you carry is really your own — and that you carry all of it yourself. When a team works to solve a problem, it is the people of that team who do the work. Remembering that we're all people — and all different people — is an important key to success. Keeping a journal about your work can change how you work. You can record why you did what you did, and why you didn't do what you didn't. You can record what you saw and what you only thought you saw. And when you read the older entries, you can see patterns you might never have noticed any other way. Do you think you're overdue for a promotion? Many of us are, but are you doing all you can to make it happen? Start with a focus on you. Do you think you're overdue for a promotion? Many of us do, judging by the number of Web pages that talk about promotions, getting promoted, or asking for promotions. What you do to get a promotion depends on what you're aiming for. If you want a promotion in line — a promotion to the next supervisory level in your organization — what should you do now to make it come about? What risks are there? 79	What Makes a Good Question? Throughout the workday, we interact with each other on many levels. Some exchanges are so common and ritualized that we're no longer aware of them. If we revise these rituals slightly, we can add some zing to our lives. Your team is fortunate if you have even one teammate who regularly asks the questions that immediately halt discussions and save months of wasted effort. But even if you don't have someone like that, everyone can learn how to generate brilliant questions more often. Here's how. Loopy Things We Do is in Acrobat format, which gives you several advantages. You can print it, and read it like any book. Or in electronic form, you can use the search capability of Adobe Reader to find passages of special interest to you. If you load it onto your laptop, tablet, or other mobile device, you can read it anywhere — and it's weightless, too. 220 pages.